[A]: As the Christmas week approaches, the year-end festivity gets infectious. It is a time to reflect on the year that is about to end, a lot of merriment and definitely to look forward to the promises of the year ahead. Baking gingerbreads, biscuits and cakes is one of those infectious rituals that seem to catch up with us too. This year I have been reflecting on the good food we have had and oh boy! it was quite a journey. Not surprisingly we have had some of the best gastronomic delights during our holidays. One of the best early suppers we had was in a restaurant in Naples. We were in Naples in transit on our way back from a vacation in the Amalfi coast. We had around 5 hours in transit and were debating what we can do to make full use of the short stay. One option was to visit one of the best museums in the world. But being the foodie that we are, we decided against it, take it easy and try some local cuisine. One of the things that we enjoy most in a new city is to loiter around aimlessly to soak in the atmosphere. It was evident everywhere from the grand buildings all around the city centre that Naples has seen better days. It may have been dethroned from its great heights, but the city still retains a vibrant charm and a sense of fashion that is quite unique. What makes any city is the people and definitely Naples is bursting full of people with character. We also discovered pretty soon that it is one of Italy’s gastronomic heavyweights. We went to the Ristorante Europeo di Mattozzi di Napoli, which is a vibrant informal family run pizzeria/restaurant. The serving plates are very colourful, like the people of Naples and the restaurant offers some fine cucina Napoletana. It is definitely our kinda place. It is best to say that there were many things that wowed us in the afternoon meal that we had. But for me the best thing that stood out was the baba au rhum. I think it is a very sophisticated “adult” cake that is not sweet, quite boozy and very satisfying – ideal for the festive season. 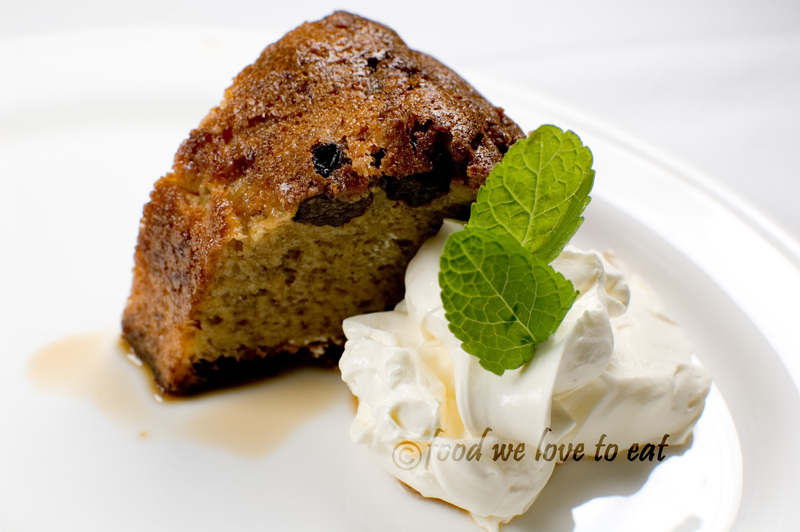 It’s based on an airy but rich yeast dough, which can absorb more liquor than your average cake without falling apart. And, unlike crepes, it’s easy to serve to a crowd. Prepare the raisins: Soak the raisins in rum overnight. This will allow the raisins to swell with rum inside. Bring the yeast to life: The dried yeast can be easily brought back to life by feeding them and providing an ambient growing environment. Bring the 1/2 cup of water to body temperature (tepid warm) and then stir in the cane sugar followed by the dried yeast. If left aside for about 10 minutes, the liquid will turn foamy indicating that the yeast has fed on the sugar and grown. Prepare the dough: Once the yeast has come back to life, beat in the eggs followed by the flour and salt. Add the butter, one cube at a time, and continue beating till there is a smooth batter. Cover the mixing bowl with a cling film and set aside in a warm place for the dough to rise and double in size. This may take from 1 to 2 hours depending on the kitchen temperature. While the dough is rising, line the inside of a 12-cup bundt pan with softened butter. 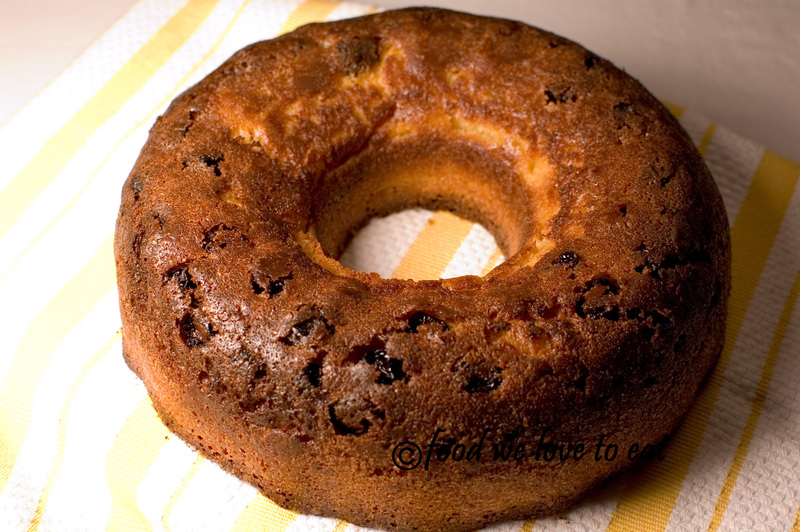 Transfer the dough into the bundt pan and spread half the rum soaked raisins on top. The raisins are heavy and will travel down the dough as time passes. 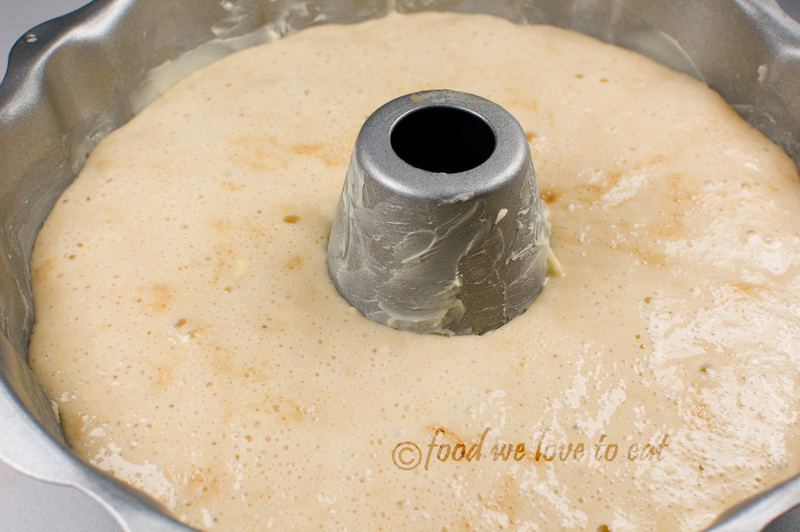 Cover the bundt pan with cling film and set aside in a warm place for the dough to rise to double its size. This will again take 1 to 2 hours depending on the temperature. Once the dough has risen, remove the cling film cover and spread the rest of the rum filled raisins on top. Push them in slightly, so that they are not burnt during baking. Again these will travel down the dough during baking. 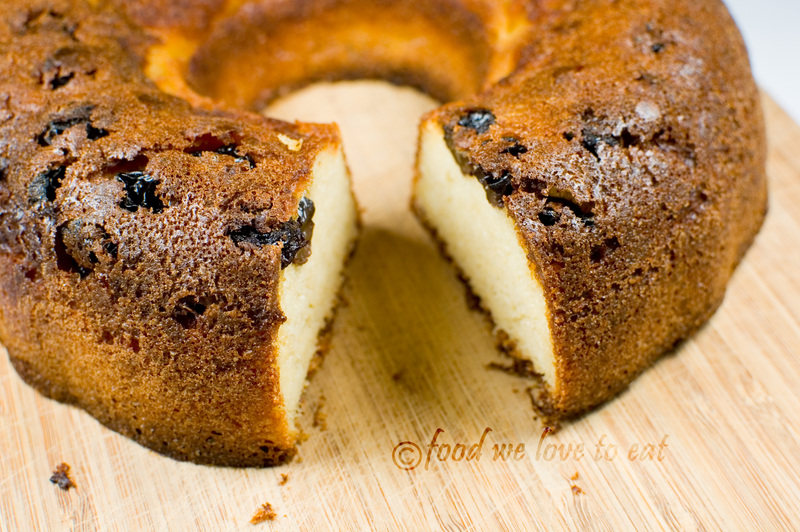 The purpose of dividing the raisins into two parts is to help them spread evenly within the cake. Bake: Pre-heat the oven to 180°C. Remove cling film and transfer pan to oven. Bake until deep golden and firm to the touch, about 35 minutes. Let baba cool in the pan, set on a wire rack, for 10 minutes. Turn out onto rack while it is still warm and let cool completely. Prepare the syrup: In a medium saucepan, combine brown sugar, 1 1/2 cups water, ginger, orange peel, cloves and cinnamon. Bring to a boil over medium heat; reduce heat to medium-low and simmer 5 minutes. Remove from heat and let cool completely. Strain into a bowl; discard solids. Stir 1/2 cup rum into liquid. Serve: Cut pieces according to your preference. Dip each piece in the syrup for 1-2 minutes. 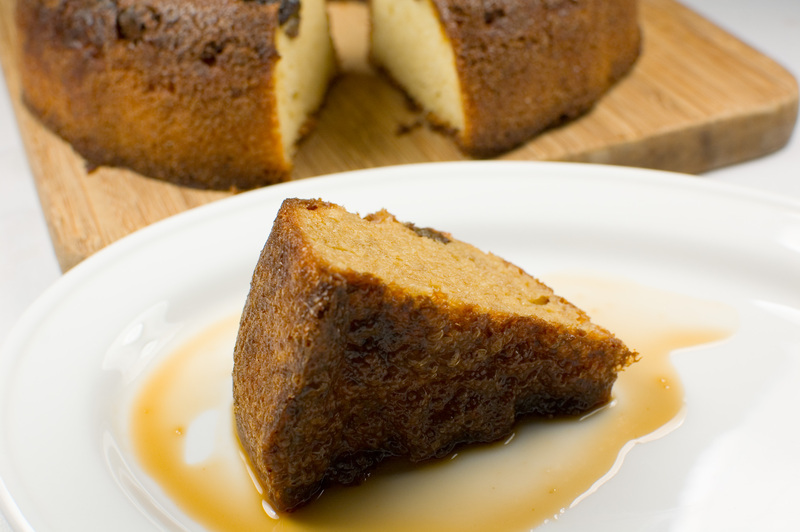 The texture of the cake is porous like a sponge and absorbs the syrup quite happily. However, it is tough enough so that it doesn’t crumble under pressure. Serve it will some whipped cream and don’t forget to generously pour a bit more of the rum syrup on the cake piece when serving.